We are back from our little adventure up the California coast. What a nice time we had visiting family, seeing friends and doing a little junk shopping (okay, and I might have bought a few pairs of shoes too). We had a great time although I wish we could have avoided the darn 98 degree weather that was hanging around. Today's project might take a few hours to complete but it was so relaxing I'm already planning another project using the same technique. The best thing about? there is no wrong way to do it. Just pick the colors you like and color away. 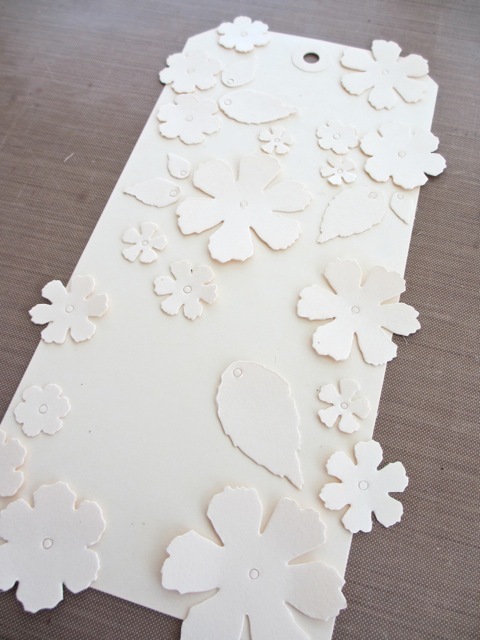 I started the project with the Tattered Flower Garland decorative strip and some Ranger manila cardstock. 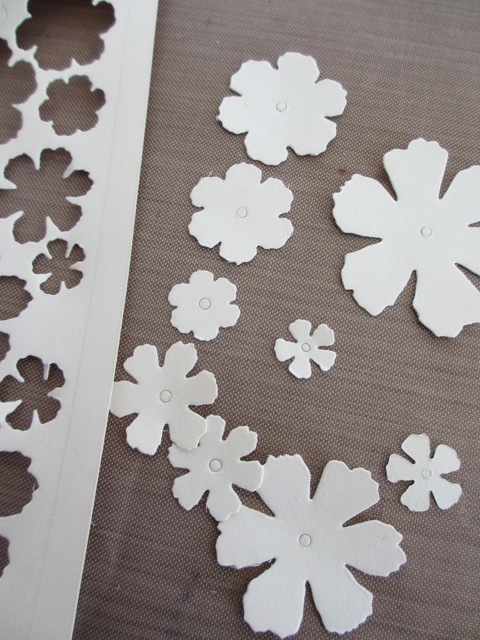 I cut the decorative strip twice to get enough of the flowers and leaves I needed. 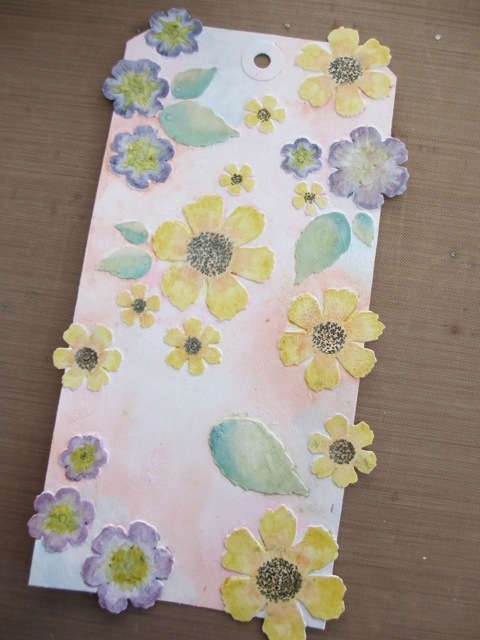 I arranged the flowers on a large #10 tag. 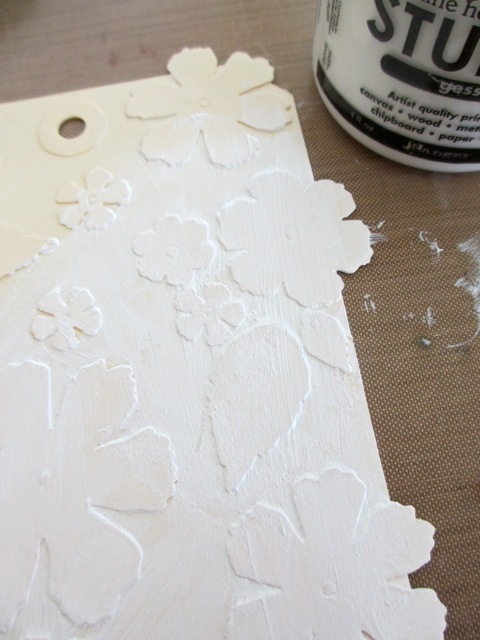 Then used Glue n' Seal to adhere them to the surface. Once they were glued down I went over the entire surface with Glue n' Seal. Then dried it with the Heat it tool...it only took about a minute. 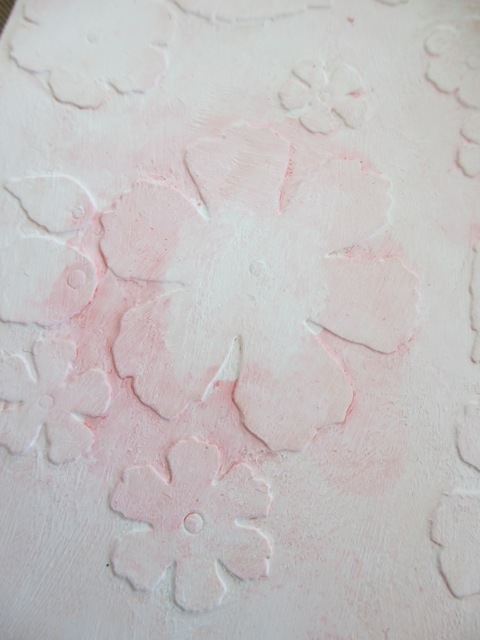 Once dry and cooled off, I covered the entire surface with Gesso. I gave it two thin coats and set it aside to dry. 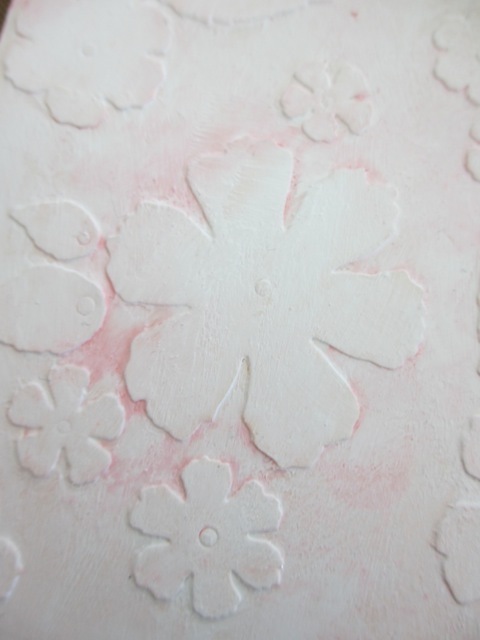 Once the Gesso was dry I covered the background surface with Distress Stain. 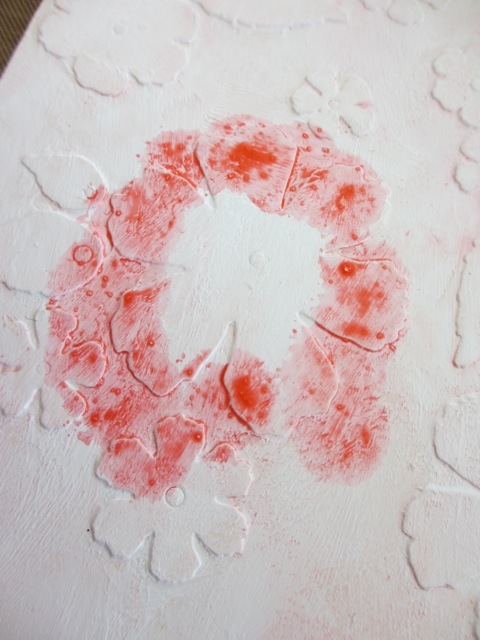 I used Spun Sugar, Worn Lipstick, Ripe Persimmon, and a touch of Tumbled Glass. 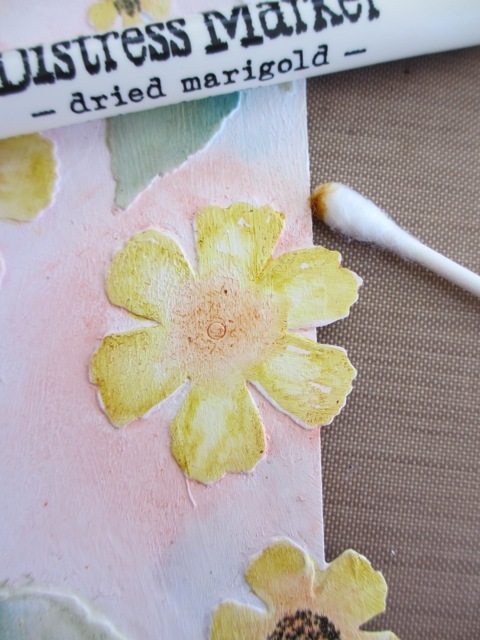 Spun sugar is so light that I used it all over the background, dabbing off the flower areas. I went around some of the flowers. 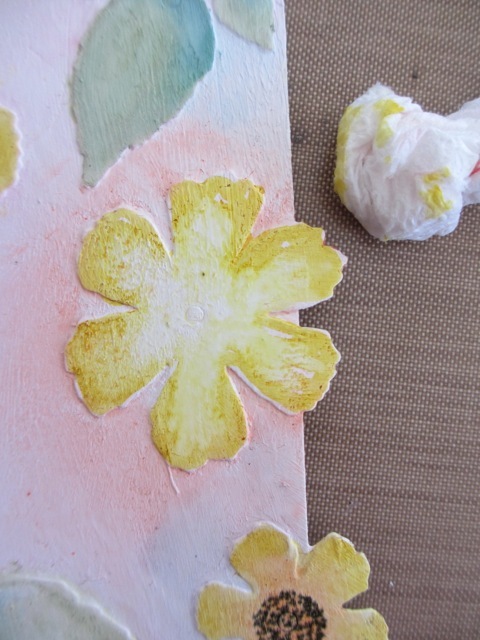 My goal was to get the stain into the part between the flower petals. The color comes out bold which is fine...just keep following along. Next, I dabbed stain with a small piece of a dry paper towel, sometimes blending the stain with my finger tip. 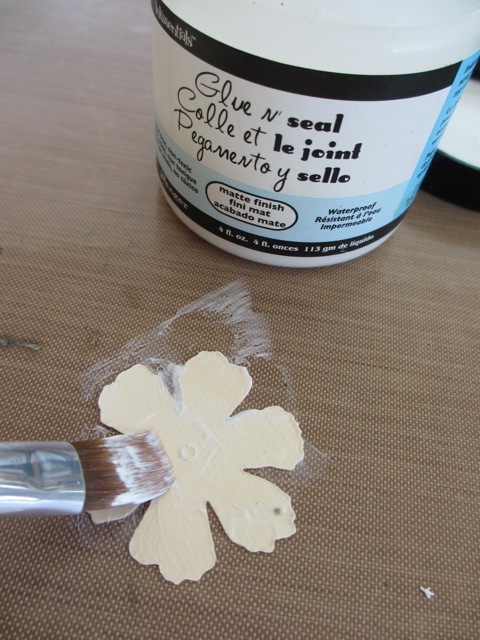 Once you like the coloring, wipe the flower with a wet wipe. Super easy. I did the same thing with small patches of Ripe Persimmon. And the Tumbled Glass. Love how you can build a layered background with the colors. 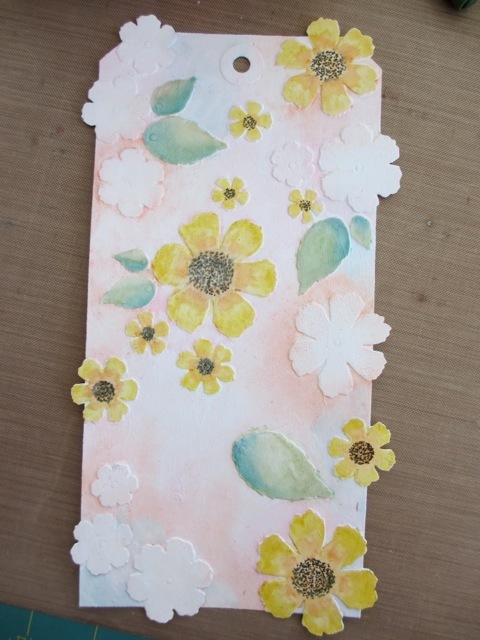 I used Distress Markers to "paint" the flowers and leaves. Starting with the leaves, I used the brush end of the marker to colored one half of each leaf (one or two at a time). 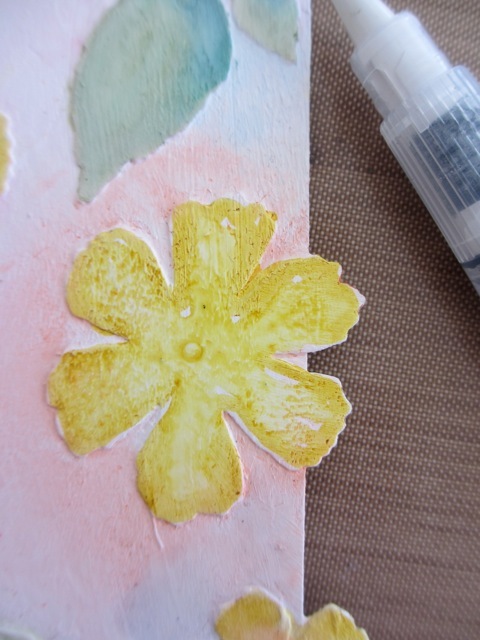 Then used a water brush to draw the color across each leaf. 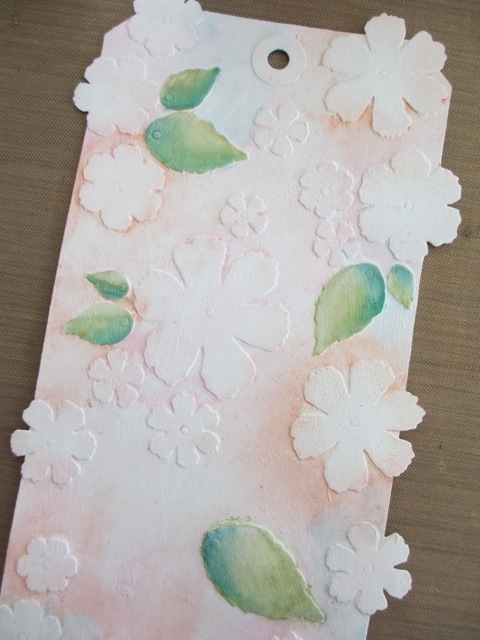 Once I finished the first layer, I dried the leaves with a Heat it tool. It won't dry completely at this stage but it will allow a little more control with the next color, Pine Needles. 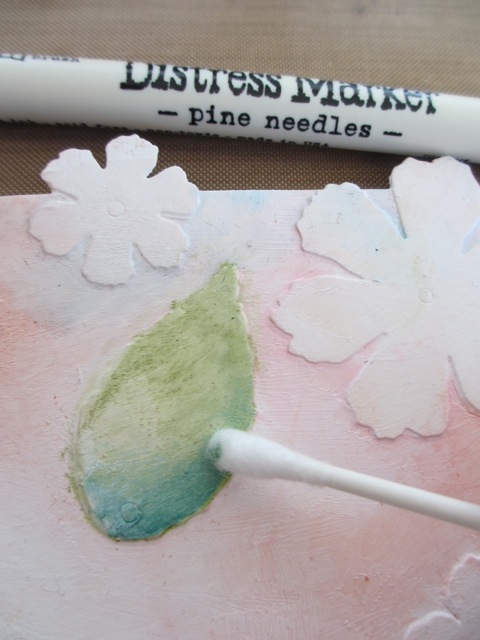 This time I colored part of the leaf and then blended with a Q-tip (use the water brush when needed). Here are my finished leaves. 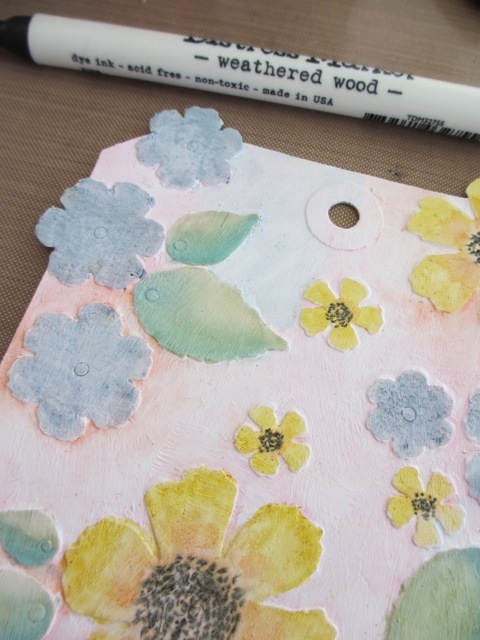 I used 2 kinds of flowers on the tag. If you look at the previous picture you can see the difference. I decided I would color all the flowers with longer petals yellow and the rounder flowers in purple/blue since they reminded me of violets. 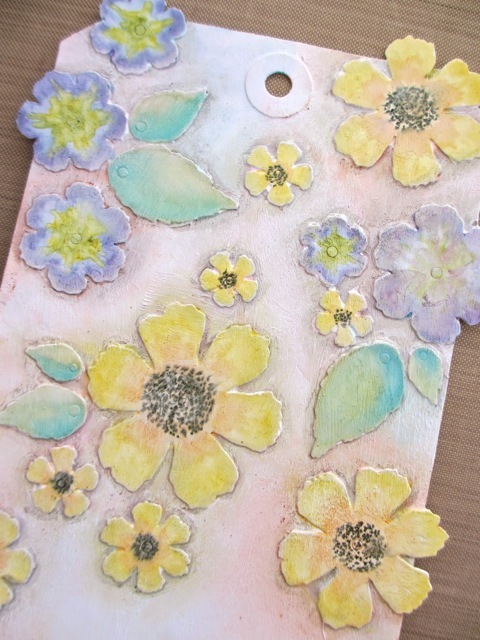 I didn't have a plan when I placed the flowers so I was pleasantly surprised to find that the flowers were mixed on the surface of the tag. 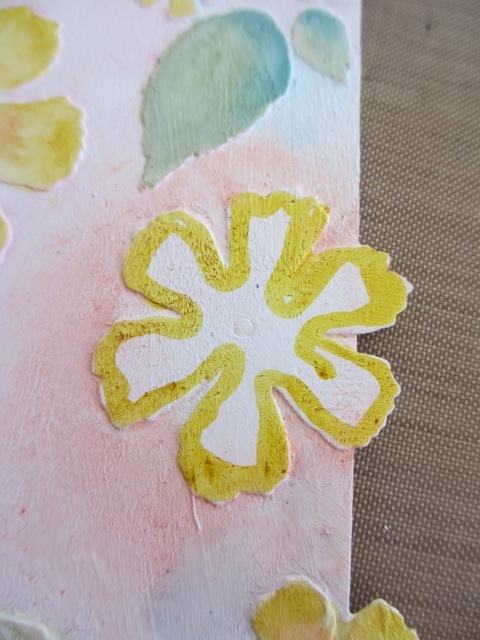 Working in small groups, I outlined each flower with Mustard Seed. Then drew the color to the center with the water brush. Again, use a small bit of paper towel to lightly dab the center. 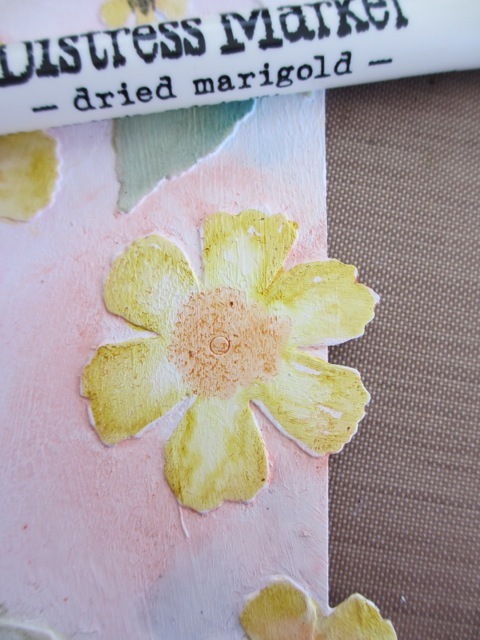 Then color the center with Dried Marigold. Blend with a Q-tip. 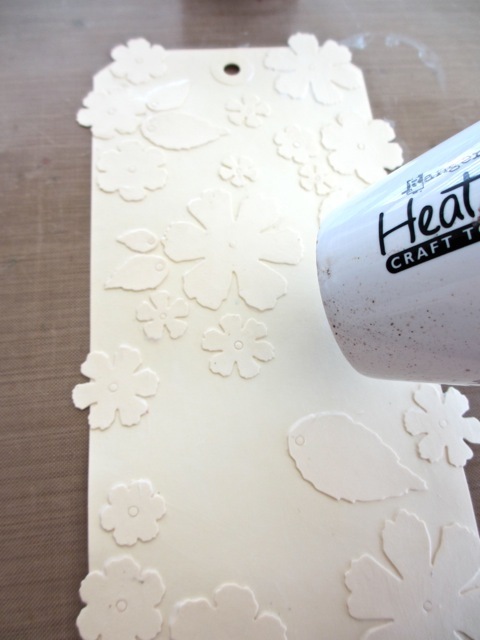 Dry with the Heat it tool. 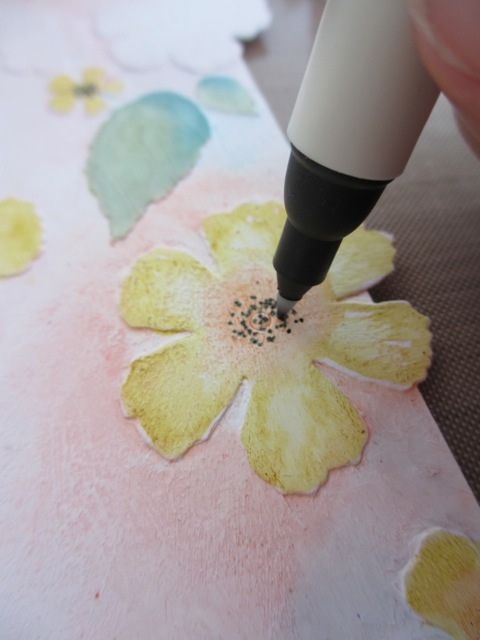 Once the flower center is dry, use the fine point tip of a Walnut Stain Distress Marker to create pin dots in the center of the yellow flowers. 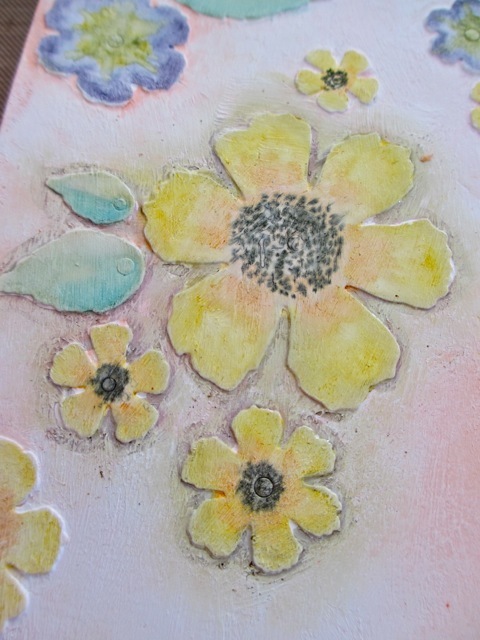 Just one more yellow flower to color in and I can move on to the purple flowers. 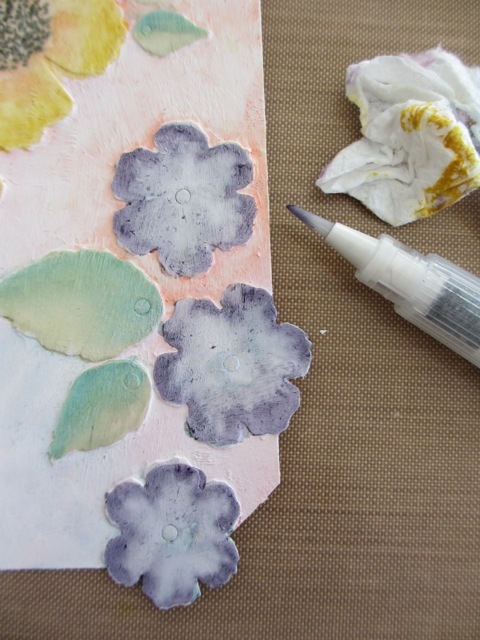 For the purple flowers, I colored each with Weathered Wood base coat. Then went around with Dusty Concord. 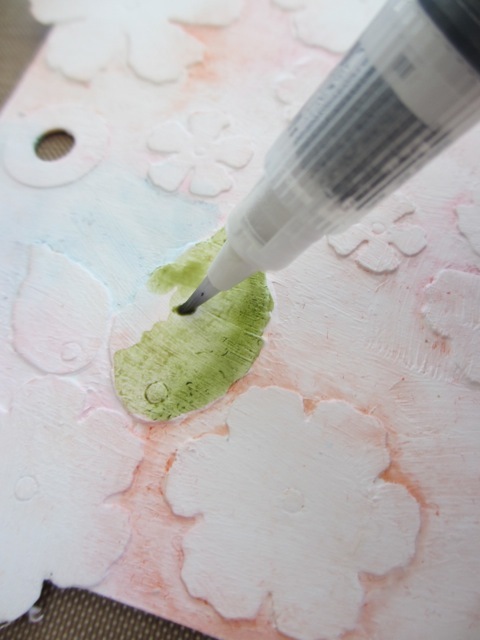 Water Brush is next for blending and of course the paper towel to dab the strong center color. I went back with Mustard Seed and Crushed Olive and the water brush to finish off the center. and blend with your finger tip. I added a small Instagram photo of three of my favorite kids...what fun you can have with a pack fake mustaches and goofy coke bottle glasses from the dollar bin at Michaels. Four year old Little Miss in the front looks like a blonde bandit! Totally in character the whole time. 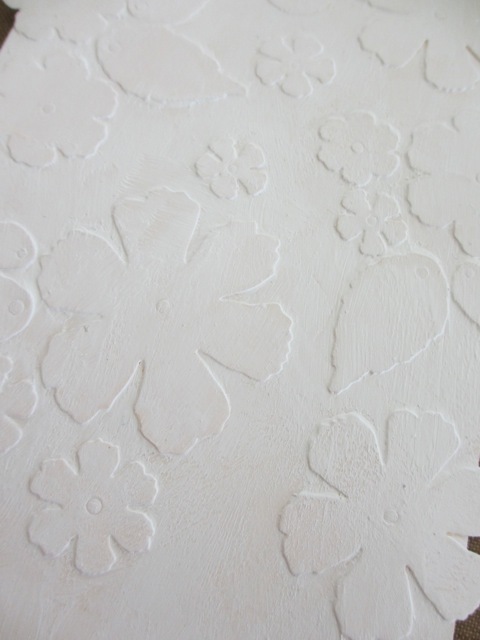 When I glued the flowers on the surface I had every intention of cutting off the flowers that are hanging over the edge. In the end, I liked the way it looked so much that I decided not to. Muse Token with white Dabber Paint hanging from a Ring Fastener. Well that's all the fun for today! I had so much fun doing this project...so relaxing just coloring the afternoon away. I can see these techniques used over and over from journal covers to cards. Hope you can too! love this!!!! 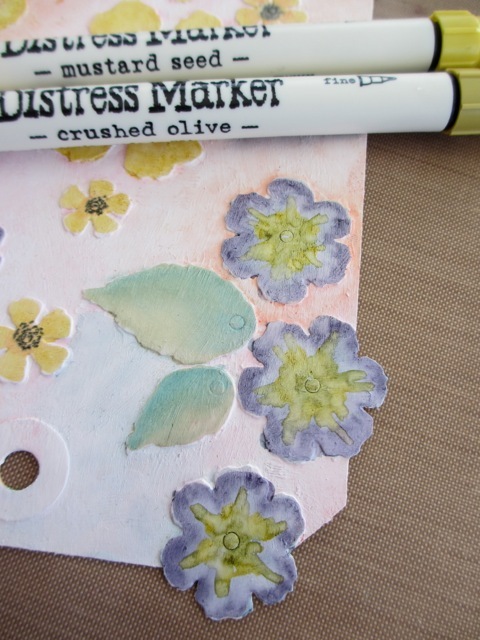 how cool...I def need to give this a try with my beloved distress markers!!! thank you for inspiring!!! This is gorgeous. Thanks for sharing. Definitely going to give it a go. Thank you for the tutorial. I may give this a try. 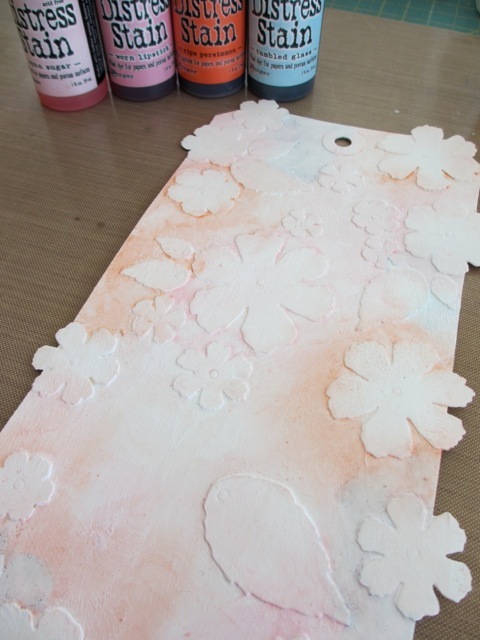 What a gorgeous tag - thank you for the step-by-step tutorial, Paula! I love that cute photo, too. You are so talented. Love this. I LOVE it! So pretty Paula...tfs! How cool is that? Very inspiring! Really like your tag! It looks like a lot of fun and something we can all try. Great idea! 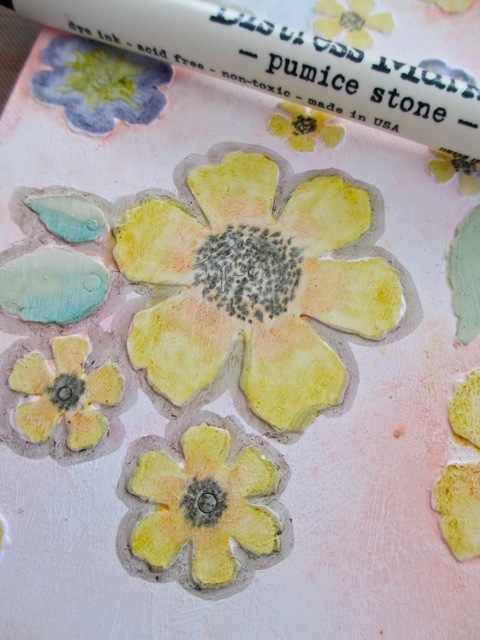 The flowers look as if they are tiled into the surface...like a mosaic. Very cool! TFS!! Wow, this is absolutely fabulous! I'm going to have to try it out. 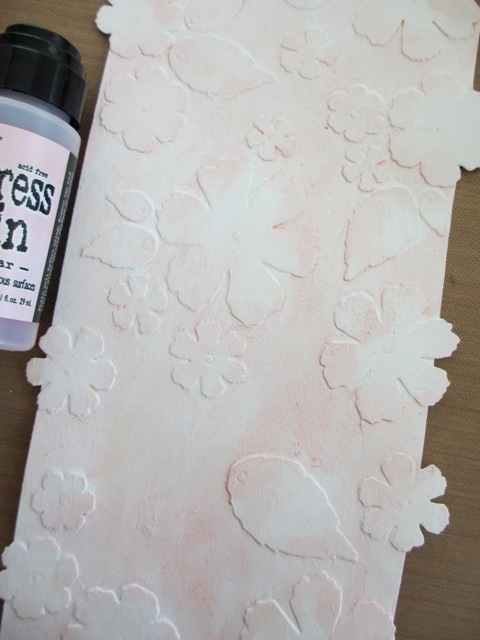 Thank you for sharing the tutorial, it is beautifully written and photographed! What a lot of work you've put into it. This is just exquisite! Thanks for such a beautifully detailed tutorial! What a great idea!!!! I love it! I need to try something like this. TFS. Awww, this is brilliant...love it...great tutorial! wow what a great idea, love it! This is just beautiful -- thanks so much for the great tutorial! Awesome! Love the tag. I haven't been able to get a set of your markers yet but sure have lots of plans when I do get some. Thanks for shareing. That sound was Paula hitting another one out of the ballpark! I have got to try this latest technique soon! Love it, so nice. Thanks for a great idea. Have a nice weekend. Thanks so much for sharing this wonderful technique! 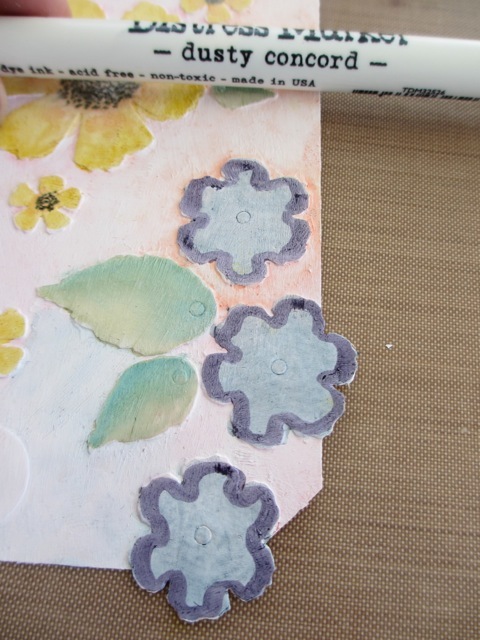 I love the flowers hanging over the edge..and I love the pin dot centers. Cute, cute kids....made me smile. Love your blog! What a great tag! Love how you've done the flowers in such a realistic way... fab!! So beautiful. Love the flowers over the edge and terrific and fun pic of the kids with their mustaches. Definitely one of a kind! Great project and fun techniques. What a fun tag, fun to make & fun photos! What a great way to "paint". I'm going to give this a try for sure. Thanks. 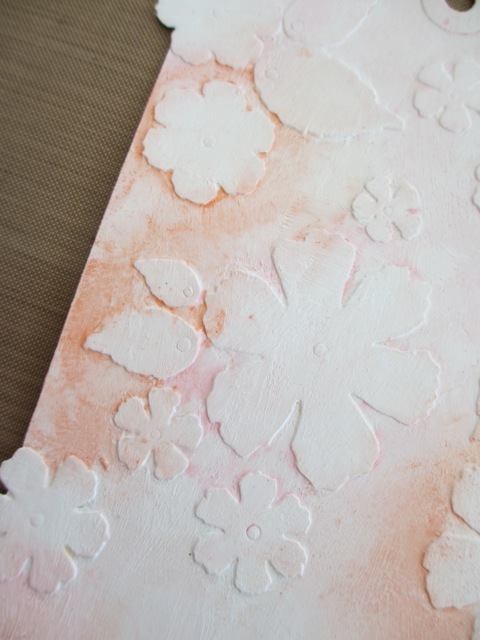 This is a fascinating project and I love how it came out!! Thanks so much for showing all the steps - I am definitely going to give this a whirl! Awesome-awesome! I love it so much. I can't wait to get to my craft room to try it out. Gotta cook breakfast first. So beautiful, that technique is amazing... adding it to my must try list :) ! The tag looks like so much fun to create. I love the end result! Thanks for sharing Paula. Love how the tag starts out. That technique is going to be a new fave for me! What a surprise finish! Loved the tag. super lindo!!! me encanto tratare de hacerlo. 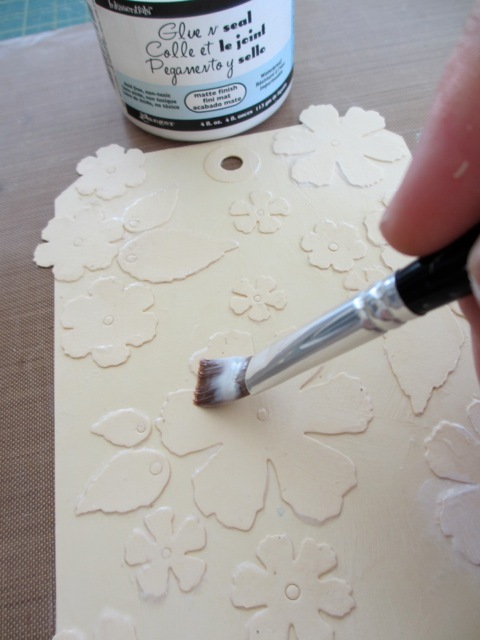 Gorgeous tag and fantastic tutorial. Put this on my project list for March. Love your tag. Thank you for excellent tutorial. I'm glad you had a great trip and I'm happy you are back with this very helpful project. This is gorgeous....such a creative project. I can see myself becoming completely engaged is a process like this...one of those times dinner doesn't get started! 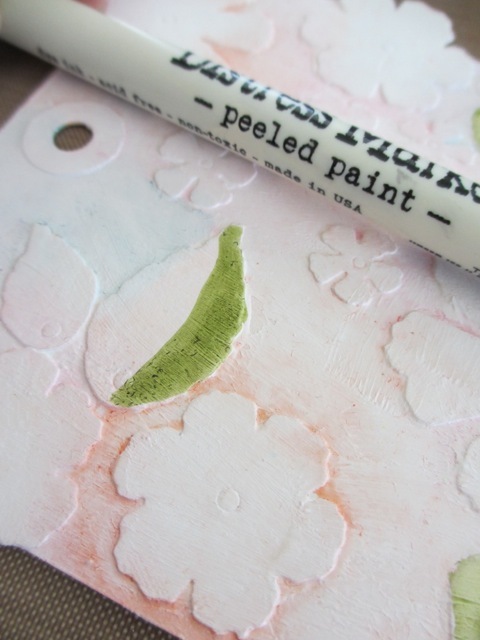 I LOVE LOVE LOVE this entire tutorial and the tag is among my very favorites! Thank you so much for the step by step! I am a novice and really appreciate your ideas and detail!